The Yakuza series has a few constants: burly men with tattoos, karaoke and cabaret, dramatic fist fights, and the city of Kamurocho. 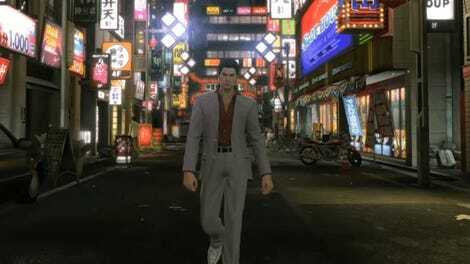 From Yakuza 0’s 1980s setting to Yakuza 6’s modern day, players have seen the city grow and expand, adding life and character to one of gaming’s greatest locations. Kamurocho is modeled after Tokyo’s Kabukichō District, a red light district full of restaurants, nightclubs, love hotels, and soaplands. Yakuza takes this vibrant setting and packs it with soap-opera charm as crime lords and police battle for control of the district. The open world is full of clubs that change ownership and shops that change as the series progresses. The first game, set in 2005, establishes important Kamurocho landmarks. 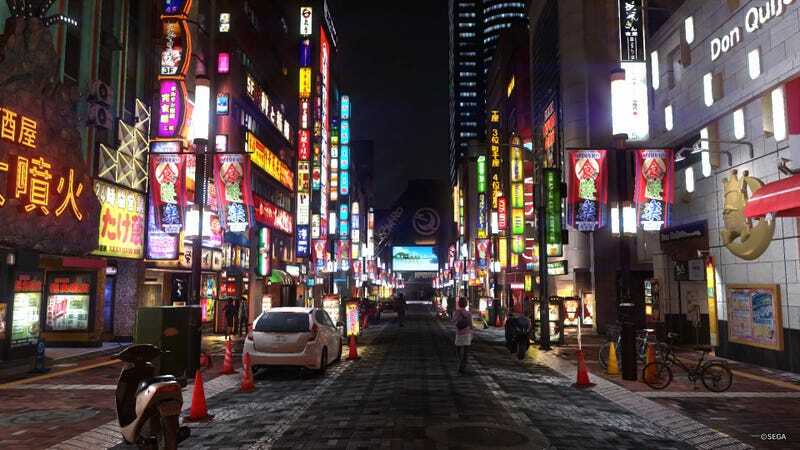 The massive MIllenium Tower sits near the center of town, protagonist Kazuma Kiryu frequents Club Serena further downtown, and bright parlors cast a neon glow down Theater Avenue. As the series progressed and time moves on, Kumorocho changes. It’s always familiar, but it’s never quite the same city from one game to the next. The Empty Lot, as seen in Yakuza 0. Millenium Tower is the most drastic example of changing space within Kamurocho. It’s the site of Yakuza’s climactic final boss fight and a pivotal landmark where much of the series’ intrigue unfolds. In Yakuza 0, Millenium Tower is yet to be built. The space is take up by a small series of alleyways and hole-in-the-wall bars. At the center of it all is the Empty Lot, a small parcel of undeveloped land that various real estate agencies and yakuza families fight over. The Empty Lot is the main MacGuffin in Yakuza 0, and much of the game centers on finding the rightful owner. The game isn’t just about learning how protagonists Kazuma Kiryu and Goro Majima earned their reputations, it is about Kamurocho itself and how it gained its grandest landmark. Equally important and ever-changing are the clubs on Tenkaichi Street near the south of the city. This is where Club Serena can be found. It is the favorite drinking spot of Kiyru and his buddy Akira Nishikiyama. The back alley behind it features in many of the series’ scenes. It is where Kiryu first meets Majima in Yakuza and the site of a plot-changing murder in Yakuza 4. Club Serena changes ownership many times throughout the series. New Serena takes its place while the offices of Sky Finance rest right below it. Sky Finance is the money lending business owned by Yakuza 4 protagonist Shun Akiyama. Throughout the series, Tenkaichi street grows dense with nightlife and offices crucial to the series as a whole. Each new game acquaints the player with another new location. It’s not just the larger changes that add character and history to Kamurocho; smaller locations and signage shift as well. The bright Big Star parlor in Theater Square eventually becomes the Volcanic Volcano during the jump from Yakuza 0 to Yakuza. The Maharaja hotel rebrands as the Shangri-la. Some of these locations remain staples of Kamurocho for years, while others fade away. The district shifts and and rebuilds just as much as its various crime families grow and restructure. While series like The Elder Scrolls opt to show the history of their world through large time skips and radical location changes, Yakuza focuses on crafting a continuous world that grows one block at a time. I know the streets of Kamurocho as well as the neighborhood I grew up in. It is a place with genuine, observable history, and that sense of realness sets it apart as a game world.